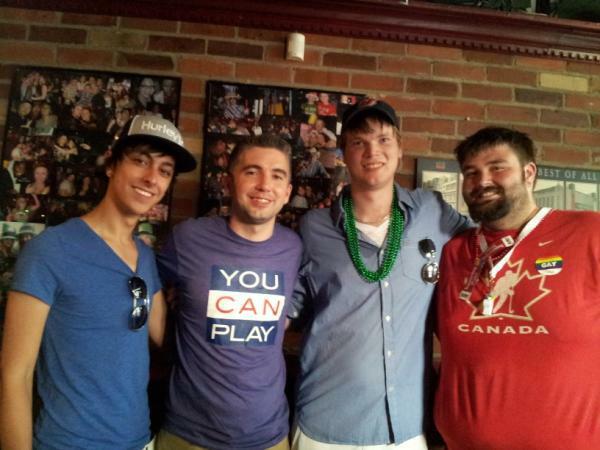 Editors’ note: We got to know Scott earlier this year after his amazing story as an out player surfaced in the Ottawa Citizen. While in high school, he taped a video for 365 days straight telling his story, and as a coda to that remarkable archive, was one he did in March of this year, shortly after the launch of You Can Play. Scott has continued to speak out and has been featured in subsequent newspaper stories, on the CBC, and in a host of blogs. He’s at University of Ottawa and was the first to organize a campus PSA for YCP (extra points because it’s bilingual). Scott has been a gamer since he was a tyke and gives us a review of NHL13. Depending on which way the lockout goes, we might be able to convince him to cover the Senators for us this season, despite the fact that he’s an off-the-hook Devils fan. Ladies and gentlemen, it appears as though I have been tasked to bring, to your assumingly gay and hockey-loving ears, the voice of a young person talking about that “video game” fad that never did seem to die down. Well, we have come a long way from pong, and so if one were to dive right in to critique the franchise of EA Sports NHL, and go “Gay for Play” without experience, there would be a lot of awkward fumbling about. Have no fear, for I am a battle-tested user of the saga. 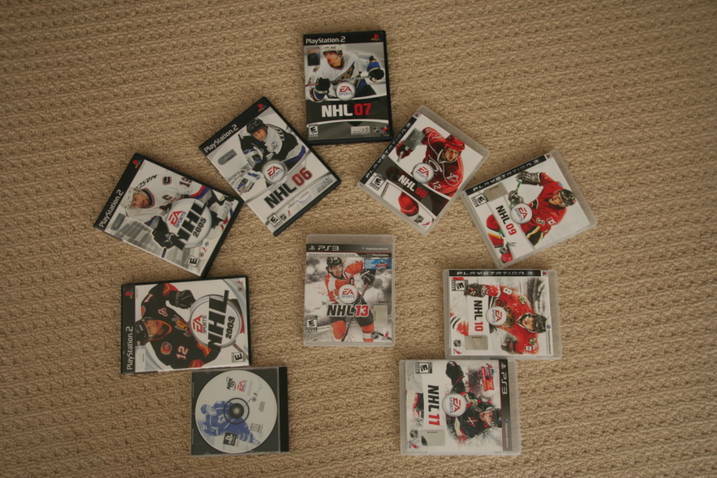 My love for the franchise began with NHL 98 when I was five years old; it continued with NHL 2003 when I was ten; and then, after NHL 2005 kept me sane during the last lockout, I have owned each edition since. I have played the game to the point that I have a designated controller where the right stick has been worn down to its plastic bone (apparently my slapshots are a little rough). 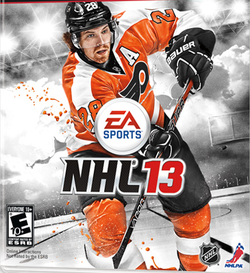 Onto the purpose of this post: an in depth review of the latest instalment to the franchise: NHL13. 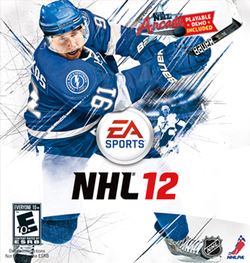 Let me start by saying this about its immediate predecessor (NHL12): I didn’t like it. The reason it is absent from the photograph above is because I traded it in while I could still get a reasonable fraction of my investment back. Why did it fail? The main improvement it sought to bring to the game, a new physics engine that saw everything on the ice bounce and be contacted with “realism,” felt rushed. The animations that resulted were sloppy and often comical. A tiny bump into the goalie could send him flying through the air, contorting like an Olympic gymnast (belated thanks to the London games) and crashing onto the ice in the opposite direction from where the momentum appeared to be directing him. 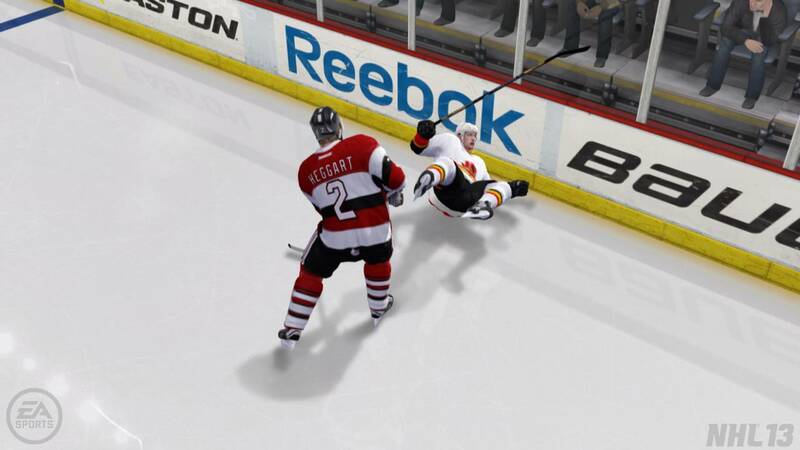 Herein lays the first huge improvement in NHL13: the physics engine has been fixed. It appears what the engine needed was not a complete overhaul, which some fans of the franchise immediately began calling for last year, but another year of development. While the odd blemish does resurface from time to time, the engine is everything I hoped it would be last year. I must admit, I was skeptical when this feature was first announced. A new skating system was not something that I thought the game needed, but upon playing the demo and now the actual game, the realism that it has added to the look and feel of this franchise is astounding. The strides and acceleration of players look and feel authentic. With thousands of new animations, and now complete limb mobility within those animations, goalies look better than they ever have. Each and every year EA Sports makes the goalies look and behave more realistically, and this year is no exception. 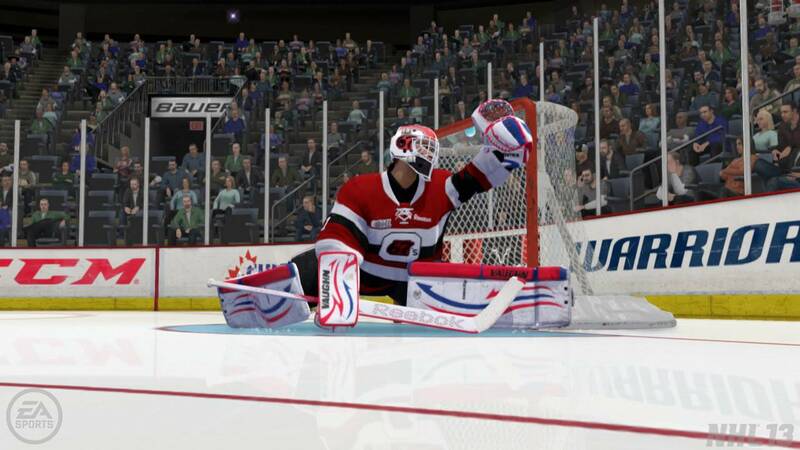 However, more attention needs to be paid to the goalie animations when playing the puck. The game itself has seen new environmental improvements which have silently made the game almost passable as a live broadcast. Snow sprays and sticks to the glass, NHL arenas are now authentic to their own unique stands (rather than generic ones), and the broadcasters recap plays with slightly more realism than before. There was a hiccup with the latter while I was playing, as the announcer went on a rant about how the goalie should have stopped the puck when I scored a goal. The problem was it was an empty-netter. Unless Clint Eastwood’s invisible Obama was in net, I’d say there was an issue there. A new mode where up to 30 user-controlled teams each with up to full rosters of user-controlled players compete against one another in seasons defined by each league’s commissioner. This sounds like a lockout waiting to happen. In this mode, relive iconic moments from last season, from the history books, or even (I take it they included this option with a great deal of optimism) this season. Let’s be honest, unless their definition is expanded to include the Swedish Elite League, there won’t be any moments to relive from 2012-2013. While the overall quality of NHL13 is the best this franchise has ever seen, and while the improvement over last year’s title is substantial, there still lacks a practical improvement that, in all honestly, would not be terribly hard to make. Ever since Be A Pro was introduced in NHL09, I have created my own Pro and battled through many careers. I have played/simmed through at least two or three seasons in each title since. The problem is that each time a new game comes out, I have to start all over. There needs to be some form of carryover from one game to the next. Obviously keeping statistics/etc. would be a nightmare, so all I would ask is to transfer over my player’s current age, position, overall rating, and team. Bring the statistics back to zero, but don’t make me start all over again with a player that can’t shoot straight (insert generic Leaf-bashing comment here). That is all for the first annual instalment of “Gay for Play.” Until next time, always remember: it’s only gay if the pucks touch. 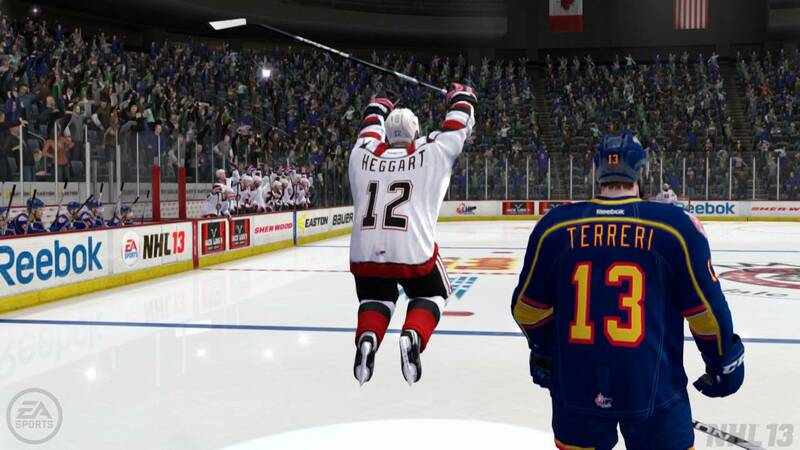 This entry was posted in Locktober, NJ Devils, Ottawa Senators and tagged He's a Devs fan but has a thing for King Henrik, NHL13, Scott Heggart, You Can Game, You Can Play. Bookmark the permalink.